Turkey is predominately an Islamic country with democratic government and pluralist parliamentary system. Cultural heritage of Turkey dates back to Byzantine and Ottoman Empires. Tourists to Turkey can experience exceptional friendliness and hospitality from Turkish people. Turkey can be accessed by air, road, sea and train. There are various options available for internal transport within turkey. Private agencies offer comfortable, affordable inter-city buses. Rental cars are available which could be hired with the drivers. Turkey boasts of distinct climatic conditions. The coastal areas experience moderate winter temperatures and humid summers, whereas inland areas experience extremely cold winters and excessive hot summers. Eastern turkey has varied climatic conditions during December to April thereby making travel uncomfortable. Central turkey has a steppe climate with hot, dry summers and cold winters. Best time to visit turkey is during spring (April-may) and autumn (September -October) as the climate is perfect for sight seeing. Turkey doesn't have winter tourism with the exception of Istanbul alone. Accommodations are closed during mid-October to April in many places like Aegean, Mediterranean and Black Sea. Haghia Sophia Museum: This museum is the masterpiece of Byzantine art. It was build by Justinian in 6th century AD. When ottoman sultan conquered Istanbul they converted it into a mosque. By the orders of Ataturk since 1936, it has been a museum. Blue Mosque - Sultan Ahmet Camii: It is one of the most beautiful mosques in the world. The museum's architecture is designed with blue Iznik tiles decorating its interior. These Iznik titles are decorated with glorious light that are filtered through 260 windows. It is a best example of Imperial Mosque of Ottoman Empire. Pamukkale: Pammukkale is the geological formation of calcium rich minerals over the edge of mountain plateau formed 14,000 years earlier. The water has got therapeutic qualities and is said to cure rheumatism, kidney and heart diseases. Some of the best places are Theater, Temple of Apollo, Colonnaded Street, Byzantine Gate, Plutonium and Necropolis (Cemetery). Ephesus: It is one of the ancient cities in the world which is a religious and trade center. Temple of armtesis, one of the seven wonders of the ancient world was dedicated to Ephesus. Major highlights of Ephesus are Odeon, celsus library, great theater, and commercial agora, terrace houses, blue Marble Street and brothel. Cappadocia : Cappadocia forms a major role in early Christian history. There are roughly around 600 rock-cut churches built by monks and hermits between 4th and 11th centuries. The church wall beautifully depicts the scenes from bible using wonderful frescoes. Pergamena: Pergamena was one of the seven churches of the revelations. Its ruins are divided into three parts - the Acropolis, Red Courtyard and Asclepion. The history of the city dates back to Aeolian Greek colonies. It became an important cultural and intellectual center during the reign of Eumenes II. Sardis: Sardis was founded near the bank of river pactolus. The city was once the capital of the kingdom of Lydia. Lydians invented coinage and developed methods to extract gold from metal ores. Best highlights of the city are the temple of Artemis, which is one of largest temples in Asia Minor and the Roman Gymnasium complex. The Gymnasium was converted into a synagogue. Sardis is one of the seven churches of Revelation. Commagene Kingdom at Mt.Nemrut: This spectacular site at Mt.Nemrut is the extension of Taurus mountain ranges in southern Turkey and is worth watching during sunset. Commagene Kingdom was established by Seleucids after the separation of Alexander's empire. This kingdom became a strategic crossover for development of trade and business routes between Syria, Mesopotamia and Rome. Gallipoli - Canakkale: Gallipoli - Canakkale became the major opening of supply line to Russia via Black Sea. One can see several war memorials in the attractive landscape of pine forests, green hills and pretty beaches. Istanbul has been the capital for many an empire from the Roman, Byzantine and Ottoman. Istanbul is the only city in the world located in Europe and Asia. It is today a unique blend of historic buildings and cultural sites as well as a swinging nightlife. Located on either side of the Bosphorus (Istanbul Straits), the city offers a spectacular view of its natural harbor, grand mosques and bazaars. Sample some of Turkey's exotic dishes - be it mezes or baklava. You can sample shish kebaps, Adana kebap or Iskender kebap, marinated in butter, tomatoes and yogurt and grilled over hot spit. Whilst on a walking tour, pick up some corn and gozleme fresh off the grill! If you have a sweet tooth, treat yourself to some milk-based desserts like sutlac or irmikl helva. Coffee drinking is part of the culinary culture of Turkey. 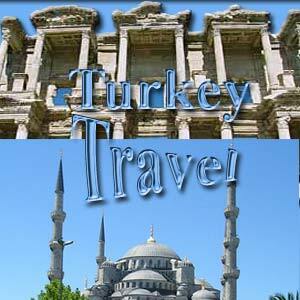 Turkey is home to couple of the wonders of the world - Temple of Artemis and the Halicarnassus Mausoleum. In fact Turkey has lent its name to the beautiful gemstone turquoise - as attractive as the color of the Mediterranean Sea off the south Turkey coast. Turkey has been mentioned in several events surrounding Christianity - from the seven churches mentioned in the Book of Revelation to the site where Virgin Mary spent her last days, after the Crucifixion. The Trojan wars were fought in Troy by Homeros of Smyrna. Today the site houses a symbolic wooden horse. It is always safer to enquire about current situation in Turkey from the embassy before departure. As there is a significant threat of terrorism in neighboring countries like Iraq, it is better to take precautions before traveling. Tourist should avoid public demonstrations as they may turn violent. Travelers should safeguard their valuables from street crime. Many parts of Turkey are prone to seismic fault line and are more susceptible to earthquakes and tremors. It is wise to take comprehensive travel insurance and check all activities and circumstances which are not covered in it. Do reconsider your travel around the border regions of Turkey, Syria, Iraq and Iran due to lack of security situations. First Published Date: 30 Apr 2009 Last modified Date: April 25 2019 This page may have been updated recently as new information is available or the content may have been edited for better readability.